Some leftovers end up as good as (or better than) the original dish. On Sunday we had friends over to celebrate six years of our children being classmates together. They recently finished their "honors project" and we wanted to thank our daughter's mentor for being such a great guide. We had grilled pork tenderloin, asparagus, an onion tart, and salad; for dessert, Madeline made a family favorite, Crazy Chocolate Cake. We had a good piece of pork tenderloin left, so last night I made leftovers. 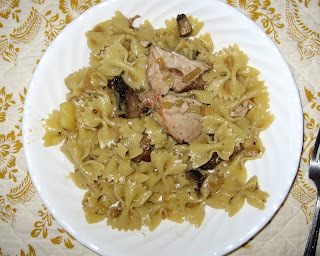 I carmelized a big onion in olive oil and butter, sliced a large portobello mushroom, diced an apple, and tossed bow tie pasta with slices of pork. I had some rich gelatin from a duck I cooked a week or two ago; my mother-in-law marinated it with Asian spices, and the resulting gelatin is rich with coriander and five-star anise. I added a few tablespoons of that as well as a bit of water and that's it - I cooked it while the kids were enjoying the warm, windy day, and we all enjoyed it before heading off to baseball, book club, and a community garden meeting. Well, let's look at the cooking the confit has gone through. First, the salt cure alone is nearly adequate to cure the meat and retard spoilage. Second, the meat was cooked for 10-12 hours at a temperature between 200F and 250F, so the core temperature of the meat was at that temperature for a long time. Additionally, duck and goose meat can be served as rare as you'd like; there's not a food safety concern with rare duck or goose. In nearly 20 years of making and eating confit I haven't had any unsatisfactory experiences. As to how I serve confit, that's my choice. I don't think there's a right or wrong way. I make enough of it that I can try new things; I'm not limited to cassoulet alone, although that's not such a bad fate, is it? This evening I sauteed a few cloves of garlic and an onion, and added cilantro and pineapple to my confit of pork belly - I served it with egg noodles, too!